The medical technology field has broadened in recent years, and now the term ‘medtech’ is a catch-all name for a wide array of healthcare services. The term encompasses product-specific tasks such as design, development, testing, implementation, sterilization, upgrades, and maintenance. It also includes more general tasks like quality assurance, regulatory advice, and contract manufacturing. Medtech no longer simply means manufacturing basic medical devices. The explosion in everyday technologies, combined with increasing patient needs, has led to a boom in this field. What’s more, the corresponding outsourcing sectors are feeling the ripple effect. The medtech industry has grown consistently for many years, and this is not going to change. Forecasts show sales increasing by over 5% annually, and set to hit $800 billion by 2030. It’s an enormous and expanding market, but a complex one whose margins can be razor-thin. There is a need for increased production efficiency, timely adherence to constantly changing regulations, and a demand for ever more complex products. All of this is driving the outsourcing market. Few companies have the resources needed to address every area involved in making and deploying medical equipment by themselves. Fewer still can do this while simultaneously restraining final costs to payers. All of this is driving the need for outsourcing. Even massive healthcare conglomerates like Medtronic now outsource parts of their business in order to protect competitiveness and profits. Simple, static medical devices are a thing of the past. Patients, doctors, and hospitals are all now accustomed to highly sophisticated devices such as iPhones and tablets. There is an expectation that medical tools function on a similar level. Well-designed user interfaces, error-reducing engineering, remote accessibility, security, longevity, and compatibility with other technologies are all required in every piece of equipment. Therefore, medical devices need complex software that is designed to the highest standard. It is not unusual for teams of engineers, designers, web developers, security experts, and programmers to work together to achieve this. Furthermore, every device must be approved by the FDA. It is increasingly difficult for healthcare companies or manufacturing companies to meet all of these standards without some outside help. Outsourcing medtech IT services and software is the only viable option for many companies. Healthcare markets of all types, across all countries, are expanding due to aging populations and the growing prevalence of chronic conditions. The medtech market may have started with life-saving emergency devices, but it is now focusing on multiple diverse areas. These areas include complex implantable devices aimed at improving long term quality of life. Additionally, hospital equipment, wearable tech, robotics, disposable equipment, software, testing services, and support services all make up the medtech sector. The US medical device industry is estimated to be worth $173 billion in 2019. Forecasts show a compound annual growth rate to be 5.3%. 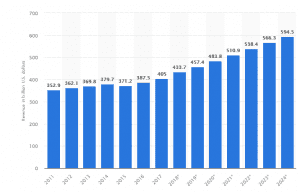 US healthcare expenditure is 17.1% of GDP. There are over 6,500 medical device companies in the US, producing over 4,000 different types of devices. As one example, Johnson and Johnson made $27 billion from their medtech division in 2017. Global outsourcing market forecast to be $195 billion by 2025, up from $94.2 billion in 2018. Market compound annual growth rate of 10.9%. Globally, contract manufacturing (the largest outsourced item) will reach $104.5 billion by 2025. A number of factors are behind the boom in this industry, not just aging populations or high customer demands. Technological developments, as mentioned above, are enabling more patients to access smart healthcare. Plus, more companies with a diversity of expertise are entering the arena. Improving economies in countries such as India and China also play a role, as more people are able to access and demand high levels of healthcare. Regulations play another big part in changes to the market. Increasingly complex requirements must be met, and promptly. But, while this presents a challenge, it is helping increase the overall adoption of medical technology. All of these changes improve customer experience and safety. As access becomes easier and devices become safer, more patients can utilize this medical technology. For example, in the US, which spends more of its GDP on healthcare than any other country in the world, over 100 million adults have diabetes or prediabetes. Diabetes devices used to measure glucose levels and deliver insulin are a significant factor in this major global market. There’s also a wave of M&A activity taking place in the sector, backed in part by a lot of venture capital interest. This trend will see more new entrants shaping the future of the medtech market over the next few years. The need for outsourcing in the medtech industry is clear. Studies show that outsourcing helps original equipment manufacturers reduce production costs by 15%. Returns for those companies who use outside partners are significantly higher. Medtech companies reporting strong returns on investment are 2.6 times more likely to have outsourced than their struggling counterparts. As hospital budgets decrease and individual patient spending comes under scrutiny, passing on high production costs to consumers is simply not an option. Regulatory issues come into effect here too. The Affordable Care Act, for example, imposes a 2.3% duty on all medical devices sold domestically in the US. This slims medtech profit margins further and puts added pressure on companies to optimize production and reduce costs. With numbers like these, it’s hardly surprising that so many are turning to outsourcing. For one, startup costs and internal costs can both be kept low. The speed with which products can hit the market increases significantly with the use of an appropriate outsourcing partner as well. There are a few things holding back the adoption of outsourcing in the medical field. Many companies fear delivery delays, quality issues, and third-party inability to comply with regulations. Issues in any of these areas could brand an outsourcing partner as ‘unreliable’. Security and privacy also matter more in medtech than in many other industries. As a result, using in-house teams for product development, design, testing, security, quality, and compliance often seems safest. Total autonomy over the supply chain was once considered key to secrecy as well. The changes in the marketplace over the past ten years are changing minds. Companies can either maintain everything in-house, struggle with limited expertise and resources, or utilize outsourcing to produce the same result, in a more efficient manner. Obviously, those companies that chose to retain vertical integration at the expense of performance have not fared well. What began as a trickle became a wave of players moving towards outsourcing. This happened at first incrementally, but as processes have become more commonplace, this is now true for entire portions of business. Outsourcing is now so ubiquitous that the range of trustworthy third parties and consultants in this space softens many of the old fears regarding reliability. And together with the benefits of lowering costs, increasing agility, accelerating production and growing returns, outsourcing also allows companies to focus on non-core activities such as research. Research will be a crucial driver in the market moving forward. Companies giving themselves room to focus on this are more likely to succeed. The FDA governs medical device software, and providers have a lot of hoops to jump through. Software must be unambiguous, consistent, verifiable, traceable, complete and correct. These requirements must all be true of all aspects of the software, including interfaces, data storage, performance, security, and safety. This is no small task. When layered on top of all the usual software requirements for any high tech device, it can be overwhelming for non-experts. As if all this weren’t tough enough, remember that software is not static. It requires updates and must respond to variable user inputs. It must be a dynamic part of any medical device, requiring ongoing attention and expertise. Software management, especially of complex instrumentation, requires considerable planning and effort. Data collection from deployed devices is an important tool in understanding use and developing upgrades as well. But again, this is a hefty task requiring ongoing connectivity, tracking, and service of the instrument in question. Training staff in-house to perform these tasks, or hiring software experts directly, is an expensive and lengthy process. 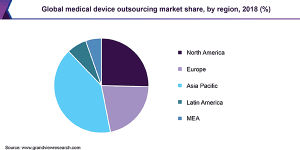 Outsourcing the digital side of medical devices is necessary for many firms who lack sufficient expertise to develop and deploy a product themselves which meets every requirement. More mergers, particularly of IT companies with traditional healthcare providers to produce disease management businesses that rely on AI. A move toward home-based care, partly for cost reasons and partly to increase the number of patients that receive treatment. Patients can connect to at-home devices and doctors can monitor remotely, saving time and costs. These devices also help eliminate accessibility issues. AI developments in certain fields, such as image recognition, will have a big impact on medical areas like radiology. Advances may mean that human diagnosticians are phased out and AI-related medtech providers become indispensable. Robotics are infiltrating hospitals. Sophisticated surgical robots that decrease risk to both patients and doctors are taking over simple systems, such as billboards. This trend will continue, with more and more sophisticated robots for complex tasks. Increased complexity comes with increased risk, and there will be more focus on IT security in medical devices in the future. Devices have been compromised by hackers in the past. A prevailing need for high-quality and efficient medical care will prevail. Medtech is on a solid trajectory of growth with nothing in its way. Outsourcing will continue to be a partner in expanding medtech services. Companies in the field are striving towards greater innovation, new markets, and new revenue streams. All of this relies on outsourcing, not only for simple contract manufacturing but as a critical partner in problem-solving, product development, and ongoing delivery.